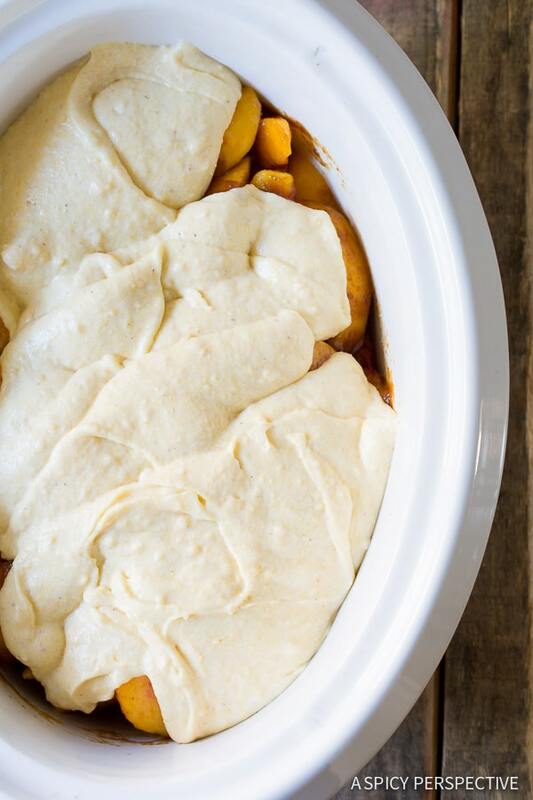 Slow Cooker Peach Cobbler Recipe – A southern treat you can cook all day while you’re working. 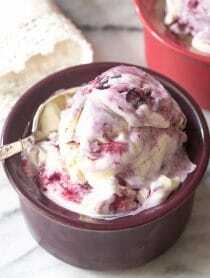 Then enjoy with a scoop of ice cream in the evening! We southerners know our cobbler. There are many fruity desserts that are often labeled cobbler… Crisps, crumbles, buckles, brown bettys. As with so many classic dishes, there isn’t just one method for preparing a perfect cobbler. I’ve found you can make a wonderful traditional cobbler in the slow cooker, on days you want to meal-prep in the morning and forget about cooking the rest of the day. Here in North Carolina, we are on the cusp of peach season. All the glorious peaches from south of the border (The South Carolina border, that is) are almost ready, but not quite. I made this Slow Cooker Peach Cobbler Recipe with frozen peaches today but will be making it again soon with fresh summer peaches. Peaches are fabulous on their own, yet even better when doctored with spices and booze. Musselman’s Apple Butter – Believe it or not, the deep apple flavor and spice in the apple butter make the peaches taste even peachier. Bourbon – The bourbon provides a rich caramel note to the filling. I covered the peach filling with a classic cobbler topping made with a bit of cornmeal for texture. After pouring the cobbler top over the peaches it’s important to spread it all the way to the edges to create a barrier. Then cover the slow cooker with a paper towel to absorb the condensation and place the lid on top. Now it’s time to wait patiently… Or to not think about the Slow Cooker Peach Cobbler Recipe at all for quite some time. Once the top puffs up and gets crispy, the slow cooker peach cobbler recipe is ready to serve. If your Slow Cooker Peach Cobbler Recipe is finished a little earlier, no worries. You can turn the slow cooker off and leave it to rest until you’re ready to enjoy it. Then scoop out big portions of hot juicy peaches with the rich apple butter bourbon glaze and place it in bowls. Make sure each scoop has a hefty piece of thick cornmeal crust on top and don’t forget the ice cream! See The Recipe Card & Video Below For How To Make Peach Cobbler. Enjoy! 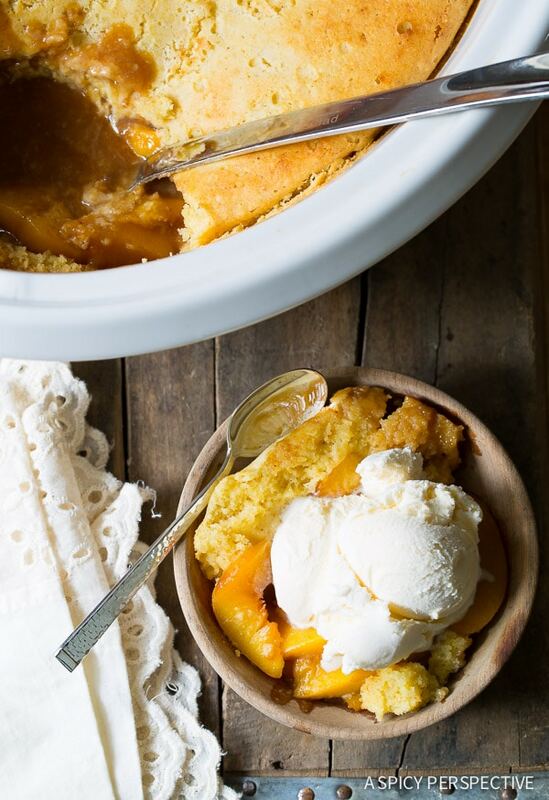 This Slow Cooker Peach Cobbler Recipe is a southern treat you can cook all day while you're working, then enjoy with a scoop of ice cream in the evening. 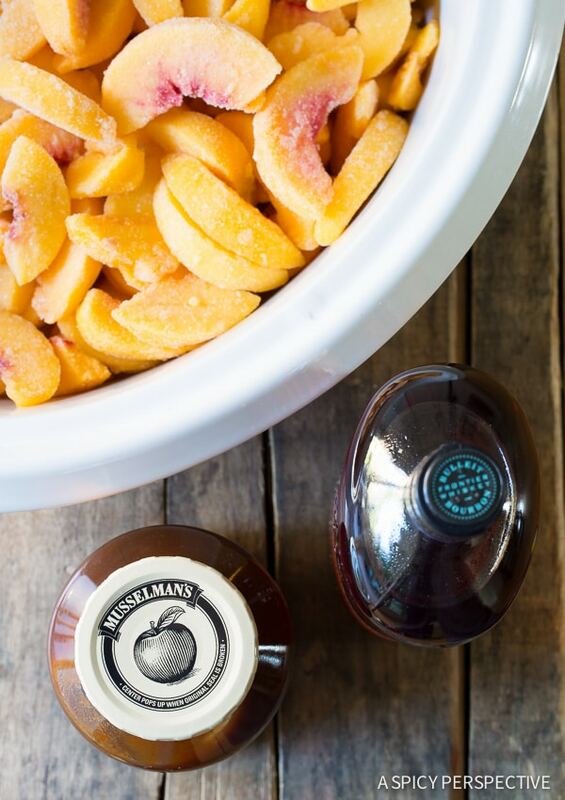 Place the peaches, Musselman’s Apple Butter, bourbon, sugar, and salt in a large 6-quart slow cooker. Stir to coat. Then spread them out evenly. For the Cobbler Top: In a large bowl, mix the flour, cornmeal, sugar, baking powder and salt. Whisk in the milk. Then whisk in the melted butter until smooth. Pour the batter over the peaches making sure it coats the entire surface. Place a long piece of paper towel over the slow cooker and cover with the lid. Pull the paper towel tight so it doesn’t sag. (The paper towel absorbs the condensation so the top can crisp.) Cook on high for 4-6 hours or on low for 7-9 hours. Once the middle of the top has puffed up and is golden around the edges, the peach cobbler is ready to serve. Check the center with a toothpick to be sure it’s baked through. Spoon the cobbler into bowls and top with fresh whipped cream or ice cream. All slow cookers differ in temperature a little – Know thy crockpot. Cooking time may vary base on the make and model of your slow cooker. 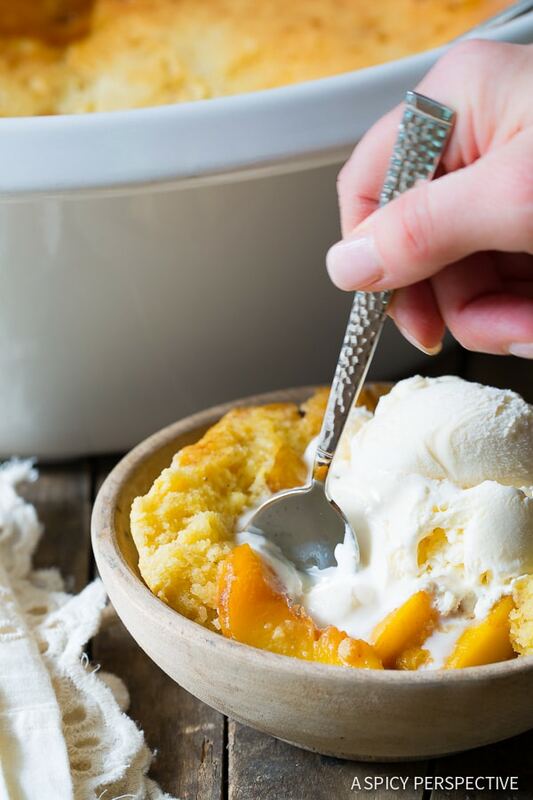 If you start with frozen peaches, expect the cobbler to take at least an hour longer. This recipe can also be made in the oven to reduce cook time. Prepare in a 5-6 quart baking dish. Bake at 350 degrees F for 30-45 minutes. 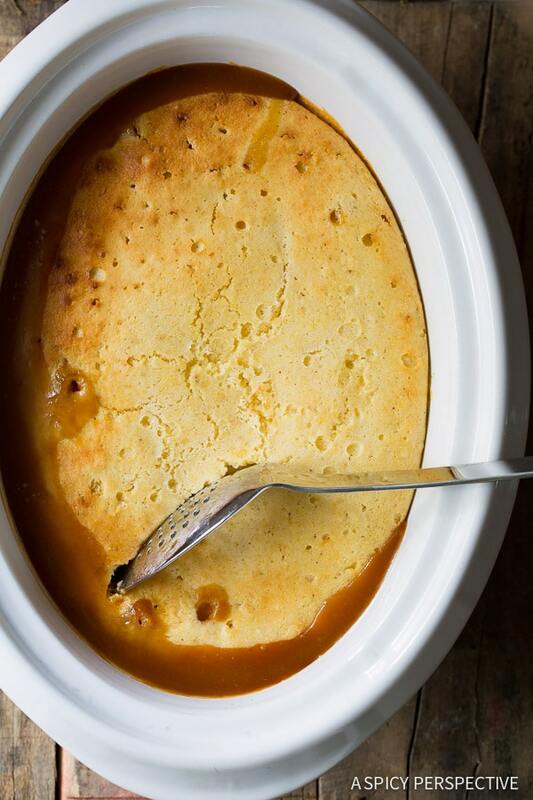 Pingback: Slow Cooker Peach Cobbler Recipe - U Wanna Know What? This is brilliant in the crock pot! 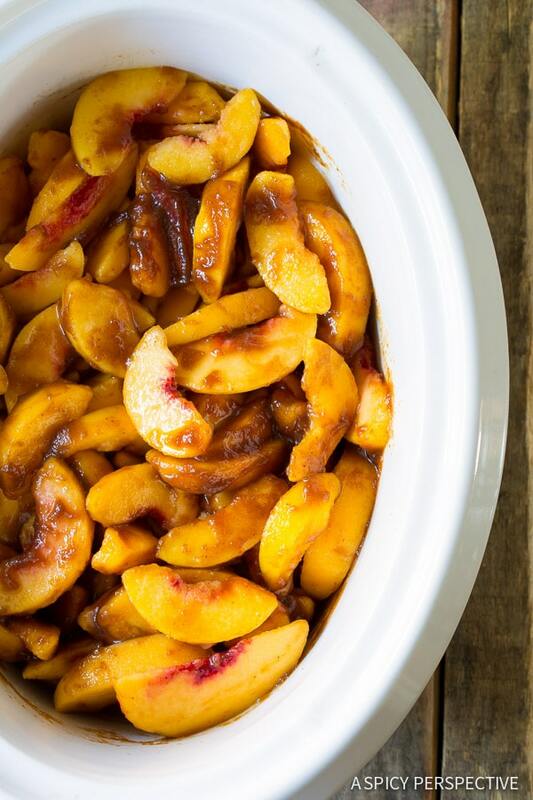 I love peach cobbler and I am loving that you posted how to make in the crock pot!!! I love how easy this is! We also never have leftovers, which is an added bonus. 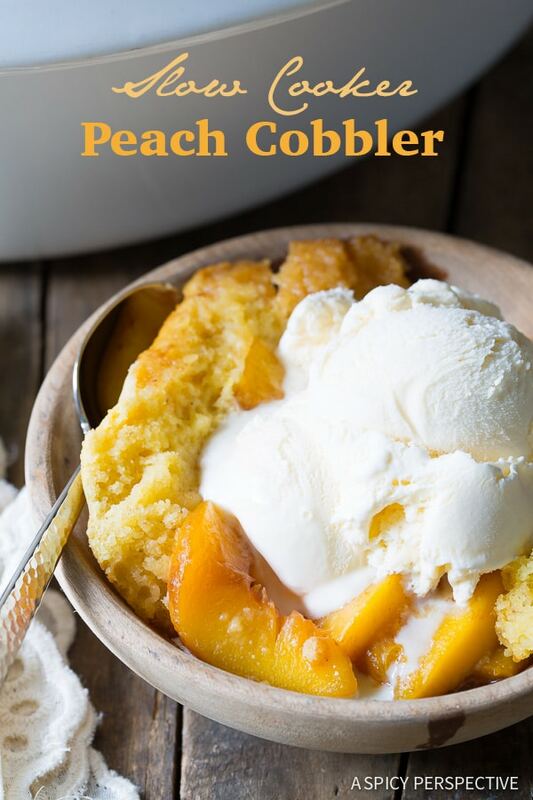 I had some frozen peaches and this was such an easy way to make a delicious cobbler!! I made this last weekend and it is fabulous! One of my favorite recipes! 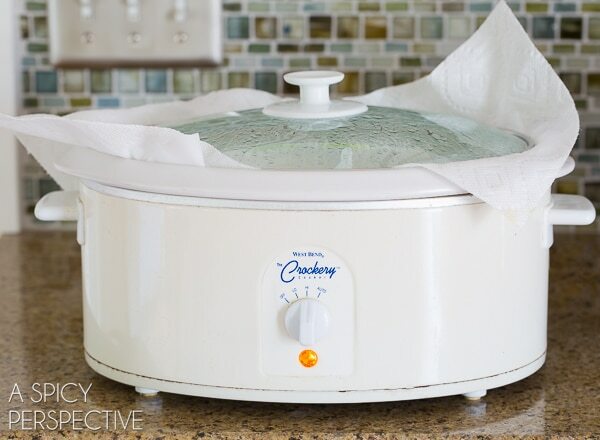 Have you tried using cloth towel under the crock pot lid? Seems like it would work but be a little more eco-friendly? Apple Butter is not a common staple in my area and I was wondering what I can replace it with. Also, how long can this cobbler remain in the crockpot once it’s fully cooked? Should it be stored in the fridge if it’s not all consumed in one sitting? Many thanks for your help and Merry Christmas! I don’t have any yellow cornmeal. What can I substitute it with, please? Many thanks for your reply. 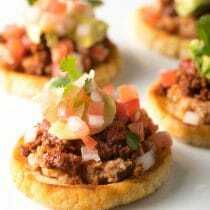 You can definitely use white cornmeal or masa. However in a pinch, you can also just substitute more flour. Happy baking! I’m going to try this recipe this weekend during a summer cook out. I’ll be using frozen peaches. Do I need to let the peaches thaw before mixing them in the bourbon and apple butter or can I mix them frozen??? Thanks! This looks so yummy. I’ll try them out. This looks absolutely beautiful! Your recipe is the best that I have found for a true peach cobbler in a slow cooker!!! Thank you for sharing…can’t wait to try it out! Have you tried this with other fruits? like apricots or others? I love this! I have to try it. I am sharing it on my Sunday Links on my blog, with full credit, of course! Thanks for such a great recipe! I have never tried making a cobbler before. Your cobbler top sounds simple enough that even I can dare to try it out. Mangoes are in season here and I so want to try making a mango cobbler..
Well you don’t have to tell me twice! I’m sold!! Come to mama!! This cobbler looks fantastic! Love that it’s made in the slow cooker!!! Love the idea of a slow cooker cobbler! This looks fantastic! What a gorgeous looking cobbler, I can’t believe it’s so easy to make in the crockpot! Is there a possibility to substitute the Bourbon? 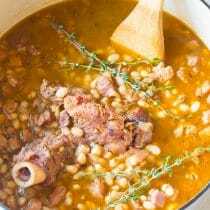 We are not drinkers but this sounds so great and love the slow cooker method. This looks fabulous! 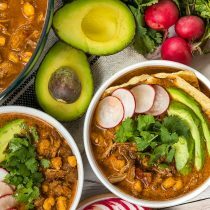 I love the idea of throwing the ingredients in a crockpot and having it ready to eat at the end of the day. Oh, and bring on the peach season! This look awesome and so nice and easy! Perfect for those hot summer days when I don’t want to be slaving over a hot stove! On my list!! This is such a fabulous recipe! Love that it’s whipped up simply in the slow cooker! What an awesome no mess dessert idea made in the slow cooker. My husband is going to LOVE this recipe. This is the coolest idea!! I love that you can get a crust like that in a slow cooker! 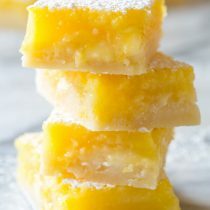 This is 100% a southern dessert haha. Love that it’s made in the slow cooker too! Up until recently I was TOTALLY guilty of blanketing cobbler under crisps and pies. Oops. This cobbler is getting me seriously giddy for summer, we don’t have fresh peaches yet, but I’m anxiously awaiting their arrival! 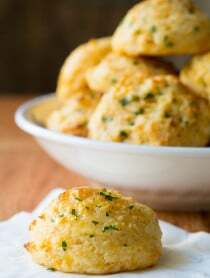 I could gobble this up real quick! Can’t wait for local peaches. Slow Cooker dessert – yesss! Love this. Totally making this for my next Telluride soiree! I love your slow cooker recipes! Adding this one to my must-make list! 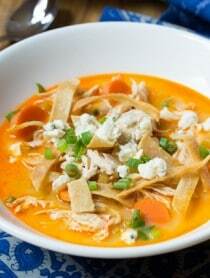 I love that this can be made in the slow cooker!! Perfect summer recipe! Love this!!!!! Such a great twist on a very southern cobbler! Love the addition of Musselman’s Apple Butter!